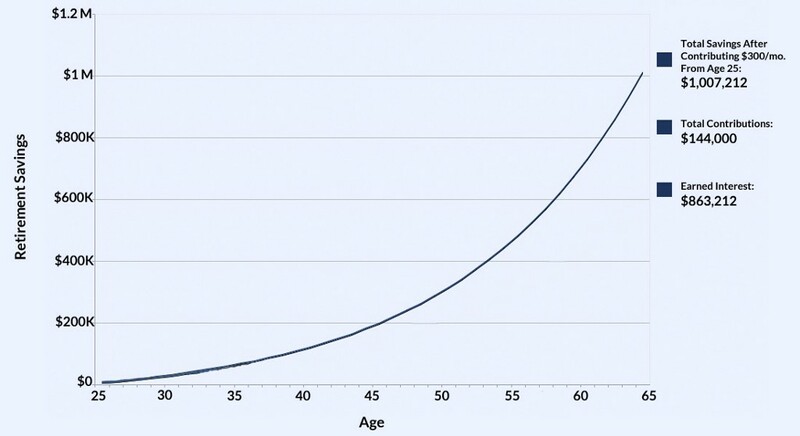 Why you need to know this: Compound interest on your investments will make you totally rich. Ugh, I know. Just reading the words “compound interest” makes me want to close this tab too, but do yourself a favor and learn about this now, because compound interest is the reason why I started saving for retirement when I was 25, instead of putting it off until I have a mid-life crisis at 35 and realize I need to start saving money or else I’ll have to work for the rest of my life (you don’t want that). It’s the reason why I’m on my way to having a million dollars saved by the time I’m 65 years old. Yeah, that’s really conscientious of you, but no. You really need to start saving now, because if you do, you’ll be able to retire at a normal age and do all the traveling you want while flying first class on all the best hovercrafts (this is what I’m guessing the world will look like in the year 2045 and I am a retired person). The earlier you start putting money into a retirement account, the more interest you’ll accumulate over time. This is called compound interest, or earning interest on top of the interest you earned in previous years. Let’s say you’re 25 years old, and you put away $300 a month into an individual retirement account (IRA), and your account earns you an average of 8 percent each year. If you did this regularly for the next 40 years, you would have contributed a total of $144,000 in your account, but would have a little over $1 million saved by the time you were 65. Congratulations, you’re a millionaire! But if you waited until you were 35 to start putting $300 a month into a retirement account, you would have about $440,000 saved by the time you were ready to retire at 65. Waiting 10 years to start saving would cost you $567,000. Math! This is why saving as early as you can is so critical. Even if you were to put a one-time deposit of $5,000 into a retirement account at 25, forget about it, and never deposit another dime, you’d still end up with about $109,000 when you retired at 65. Seriously, you guys, this is the magic of compound interest. So for the sake your 65-year-old self, start saving. Do it. It doesn’t even have to be a lot. I wasn’t earning very much when I was 25 and first started putting money into a retirement account, but the point is that I was making myself get into the habit of saving regularly. I started with $100 a month, and now I’m socking away $400 a month. I’ll be seeing you on the hovercraft. Join me in first class, won’t you?